The Guerneville area has a nice plan surrounding 4th of July — every town has its own day of fireworks and they don’t conflict. I got to attend Monte Rio’s on Saturday and Guerneville’s on Sunday (skipped Sebastopol’s and Bodega Bay’s). The fireworks are closer to what I experienced as a kid — 15 minutes of beauty, with each firework set off individually so that one can enjoy it….which makes them last longer, given the number of fireworks purchased. We’re literally burning money when we set off fireworks, and is probably one of the largest examples of a display of first world wealth I can imagine. We pay thousands of dollars for 15 minutes of fun…lighting up the sky. Causing pollution and putting hydrocarbon emissions into the atmosphere. Scaring pets in neighborhoods, and probably puzzling the heck out of the local deer and other wildlife. 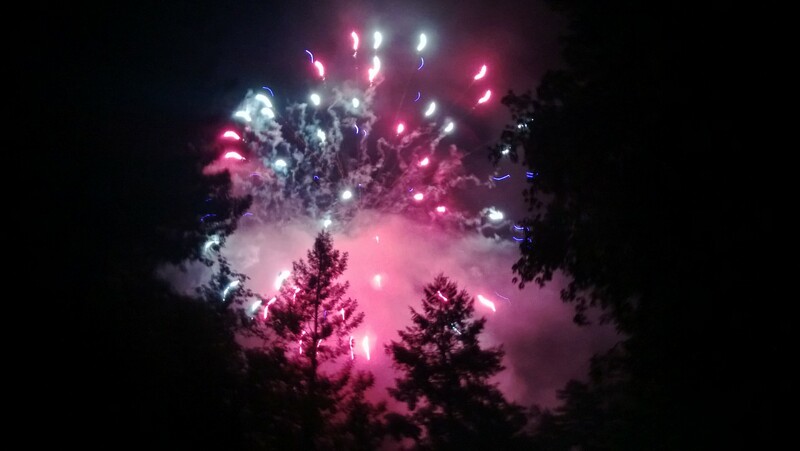 The fireworks through the redwoods I saw tonight were pretty awesome, and brought me back to those happy days of sitting on the Granville golf course admiring the display. Quality over quantity…with a beautiful green venue to enjoy it in. Life could be worse. Happy birthday, America…from your bicentennial-born admirer. You sure lit up the planet.